In August 1999, three Chevron LL652 modules were transported from the US Gulf to Lake Maraçaibo, Venezuela, using Crowley cargo barges. The modules ranged in weights from 4,500 to 6,000 t. For each tow, design motion response data was provided for the design of the grillage and seafastening. Special attention was paid to the still water and wave deflection of the barge hulls and the effect on the module supports. The photo below shows the departure of the 5,100 t heavy Gas Compression module on the Crowley BARGE 411. 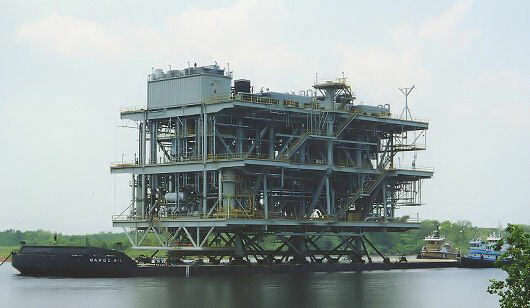 Upon arrival, the modules were successfully lifted off the barges and installed onto their jacket structures, using the Versatruss system. Photographs courtesy of Crowley Marine Services, Inc.
■ Calculate barge hull still water bending moments and their worst case wave deflection.